Location: Home › Music Articles › Dobie Gray: The "Drift Away" man on the "Last Train To Glory"
Dobie Gray: The "Drift Away" man on the "Last Train To Glory"
In 1981 Word Records' Myrrh label released a various artists album 'Premiere Performance'. The concept behind the project was that purchasers could vote for their favourite act on the album with the winner being offered a full contract with what was America's largest Christian record label. The fans' choice turned out to be Kenny Marks and the pop rocker duly went on to have a successful CCM career with a stream of albums. What was strange about 'Premiere Performance' however was that one of the acts on the album wasn't an unknown beginner but singer and songwriter Dobie Gray, who had enjoyed major American pop chart successes such as "The 'In' Crowd" (number 13 in 1963) and "Drift Away" (number 5 in 1973), the latter going gold and being considered by many critics as one of the greatest pop/rock recordings of all time. 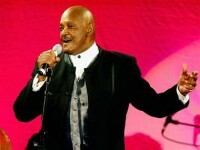 The fact that the 'Premiere Performance' buyers passed on such a giant talent says more about the limited tastes of the US CCM audience than anything else though this hiccup in Gray's career meant that his two tracks on the album, the fine "Everything To Me" and "Last Train To Glory", are the only gospel songs the singer ever got to record. Now Dobie has taken the last train to glory having died of cancer at his Nashville home, aged 71. Dobie was born in Brookshire, Texas (though there is some debate about that) in 1940 and his real name was Lawrence Darrow Brown. His family were sharecroppers and his grandfather a Baptist minister. He moved to Los Angeles in the early '60s and began singing in supper clubs as Larry Dennis, Leonard Ainsworth and Larry Curtis. A stream of singles were recorded for tiny labels until "Look At Me", recorded for Cor-Dak Records under the name Dobie Gray, made 91 in the Billboard 100. However, it was the neo-Motown dance rhythms of "The 'In' Crowd" and "See You At The Go-Go" which were bigger hits. Another single he recorded for Charger Records, "Out On The Floor" was eventually to be named a classic by Britain's Northern Soul scene. By the late '60s Gray had moved into acting while recording for labels like White Whale. In 1971 he teamed up with Tata Vega (later to record sublime gospel music with Andrae Crouch) with whom Dobie had worked in the LA production of Hair, and with Tata joined the psychedelic soul/rock band Pollution. Despite two albums it was an award for a striking sleeve photo (a newly born chick in a gas mask) which was the biggest success Pollution achieved. In 1972, Dobie won a recording contract with Decca Records, shortly before it became part of MCA, to make an album with producer Mentor Williams, the brother of hit making songwriter and singer Paul Williams. Among the songs that they recorded at the Quadrafonic Sound Studios in Nashville, co-owned by session musicians Norbert Putnam and David Briggs, was Mentor Williams' song "Drift Away", originally recorded by John Henry Kurtz. The song was a haunting tribute to rock'n'roll ("Give me the beat boy to free my soul/I wanna get lost in your rock'n'roll/And drift away"). Dobie's smokily soulful vocal, Reggie Young's nagging guitar riff and a sublime synthesis of soul and country music made "Drift Away" a Top 10 US hit in 1973. Over the following years the song was covered by Michael Bolton, Roy Orbison, Ray Charles, Ringo Starr, Rod Stewart and many more but all the critics recognised Dobie Gray's version as the definitive one. "Drift Away" was to be the song for which Dobie was associated forever after. He told The Tennessean newspaper in 1988, "I guess what you call my 'signature song' will never die, thank God." "Drift Away"'s followup, a version of Tom Jans' much-covered song "Loving Arms", made number 61 in the chart. Gray also released three albums with MCA, 'Drift Away', 'Loving Arms' and 'Hey, Dixie', but later stated that MCA were unsure of how to market the albums - "They didn't know where to place a black guy in country music." In the mid 1970s he moved permanently to Nashville and signed for Capricorn Records, writing songs in collaboration with Troy Seals. His biggest hit singles in the late 1970s were "If Love Must Go" (number 78 in 1976) and "You Can Do It" (number 37 in late 1978), his last solo chart hit. He increasingly concentrated on songwriting, writing songs for a variety of artists including Ray Charles, George Jones, Johnny Mathis, Charley Pride and Don Williams. Gray also toured in Europe, Australia and Africa in the 1970s. He performed in South Africa only after persuading the apartheid authorities to allow him to play to integrated audiences, becoming the first artist to do so in that country. His popularity in South Africa continued through numerous subsequent concert tours. The singer re-emerged as a recording artist for Capitol Records in the mid 1980s, recording with producer Harold Shedd. Gray placed two singles in the US Billboard country chart during 1986 and 1987, including "That's One To Grow On" which peaked at number 35. His country albums included 'From Where I Stand' (1986) and he made several appearances at Charlie Daniels' popular Volunteer Jam concerts. He also sang on a number of TV and radio jingles. A cover version of "Drift Away" was released by Uncle Kracker in 2003. This version, which featured Dobie Grey singing the final verse, reached number nine on the Billboard Hot 100 chart. It spent a record-setting 28 weeks atop the adult contemporary chart in the US. In his long career Dobie showed extraordinary versatility being able to sing everything from pounding Northern soul stompers to slow country ballads. He never married and right up to the time of his death donated time and money to various children's charities. He willed much of his property and future earnings to St Jude's Children's Research Hospital in Memphis, Tennessee. Gray was loved by many in the Nashville community who crowded into the Brentwood Baptist Church for the funeral service on 15th December 2011. Fans and friends alike will miss the fine singer and man. I was a young 20 year old when I first heard "Walk on Water". That song was in my mind when I woke up this morning so I looked it up and found your article. Thank you for the biography of Dobie's career. I am encouraged by his life and would love to buy a copy of "Walk on water". Where can I get one? I enjoyed reading the article on Dobie Gray, who was one of my all time favorite artists growing up. I had the privilege of meeting him when my stepfather, Frank Fenter, signed him to Capricorn Records in 1975 and, subsequently, was the man who negotiated with the South African Apartheid Government (having grew up in South Africa) to play in front of an integrated audience. In my efforts to insure my late father get into the Georgia Music Hall of Fame, Dobie Grey wrote the following email to the powers of the committee, which made me very proud of him while also revealing to me what a gentleman Dobie Gray was! “I remember Frank as the man who, among his other noble deeds, made it possible for me to become the first Recording Artist to bring together and entertain multi-racial audiences in South Africa. Until his intervention, I was steadfast in declining offers to go there because of its laws of Apartheid. But Frank could be very persuasive, and he fought long and hard to accomplish that goal. I shall always be very grateful to him for that, because even today, my greatest following is still in South Africa.